Patriotic Tin / Metal Sign - Red, White and Blue Pistol Smoke - It Takes Courage to be Free, What it Means to be American - Home / Office Decor - Gift Gun Handgun Second Amendment - 12 1/2" x 16" | BUDK.com - Knives & Swords At The Lowest Prices! Patriotic Tin / Metal Sign - Red, White and Blue Pistol Smoke - It Takes Courage to be Free, What it Means to be American - Home / Office Decor - Gift Gun Handgun Second Amendment - 12 1/2" x 16"
Boldly display your independent, patriotic spirit, while livening your man cave, garage, cabin, vacation home, living room, bedroom, office - literally any space - with this sweet metal sign! Its cool vintage style and vibrant graphics are just what the doctor - or, interior designer - ordered to cure empty walls; dull, lifeless rooms; outdated decor themes plagued by kitsch; or any case of uninspired design in need of a shot in the arm! 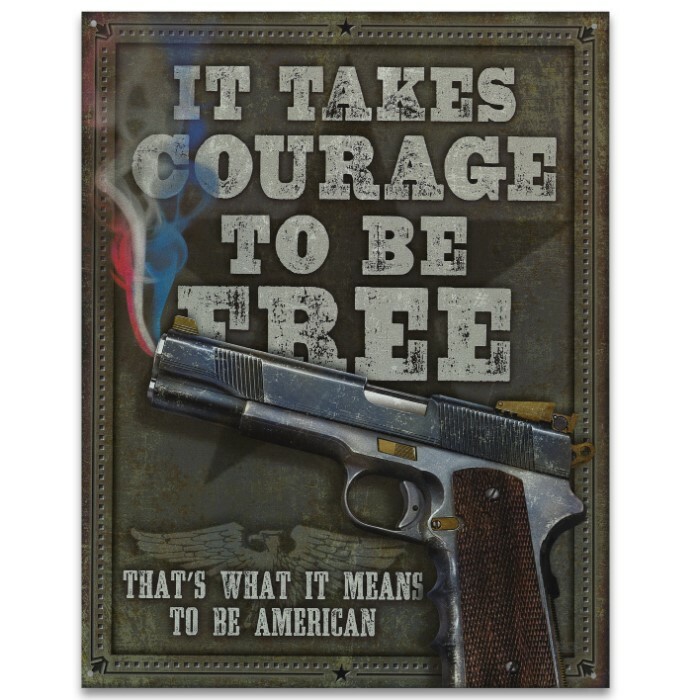 Most importantly, this eye-catching placard conveys a bold message of freedom, courage and unabashed patriotism; it's the perfect wall piece for second amendment advocates, gun enthusiasts or proud Americans of all stripes. Easy to hang! And top quality, corrosion resistant metal construction, as well as advanced, fade resistant printing even allows for posting outdoors!